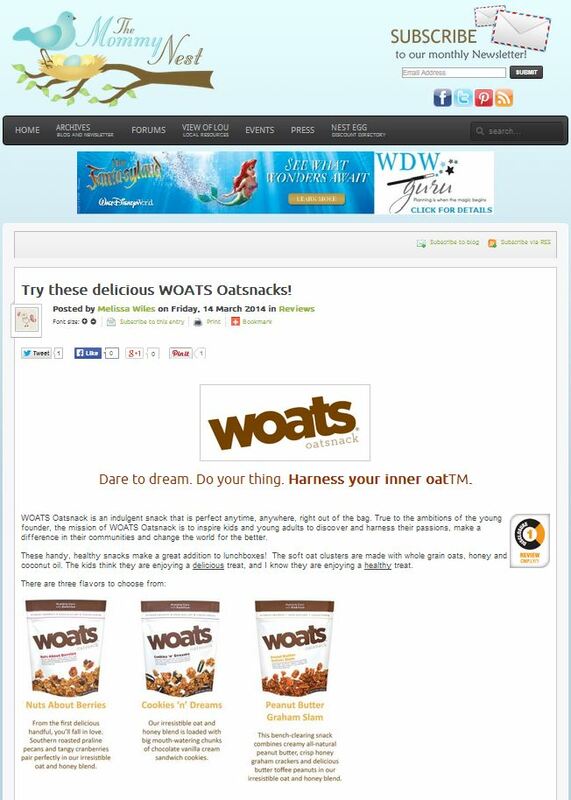 Congratulations to our Client WOATS for their feature on The Mommy Nest! WOATS Oatsnack is an indulgent snack made with an irresistible blend of gently baked whole grain oats, honey and other premium ingredients. Perfect anytime, anywhere, right out of the bag. True to the ambitions of their young founder, the mission of WOATS Oatsnack is to inspire kids and young adults to discover and harness their passions, make a difference in their communities and change the world for the better. They come in three great flavors, each one mixed within theirÂ irresistible oat and honey blend! Nuts and BerriesÂ pairs Southern roasted praline pecans and tangy cranberries perfectly. Cookies ‘n’ DreamsÂ is loaded with big mouth-watering chunks of chocolate vanilla cream sandwich cookies. Peanut Butter Graham Slam combinesÂ creamy all-natural peanut butter, crisp honey graham crackers and delicious butter toffee peanuts. Check them out at woats.com!